Location & Lifestyle - Secure Gated Complex with Pool, Tennis Court & BBQ area. Situated at the back of this private gated complex with tennis court and swimming pool & BBQ area, this spacious and practical townhouse is an absolute must to inspect. This townhouse is perfect for first home buyers, investors or those wanting a low maintenance home. •	3 generous sized bedrooms with built-in wardrobes, ceiling fans & new carpet. One bedroom is air conditioned. •	Master Bedroom with ensuite. •	Expansive private courtyard area. The location is super convenient, positioned just walking distance to several parks, walking tracks, schools, bus stops and Westfield Chermside is just 5 minutes away. Located 12km north of the Brisbane CBD, Geebung is surrounded by Virginia, Boondall, Zillmere, Chermside and Wavell Heights. Like its neighbouring suburb of Virginia, Geebung is a mix of industrial centres and residential housing. With close access to employment the area has become a mix of young and established families and retirees. 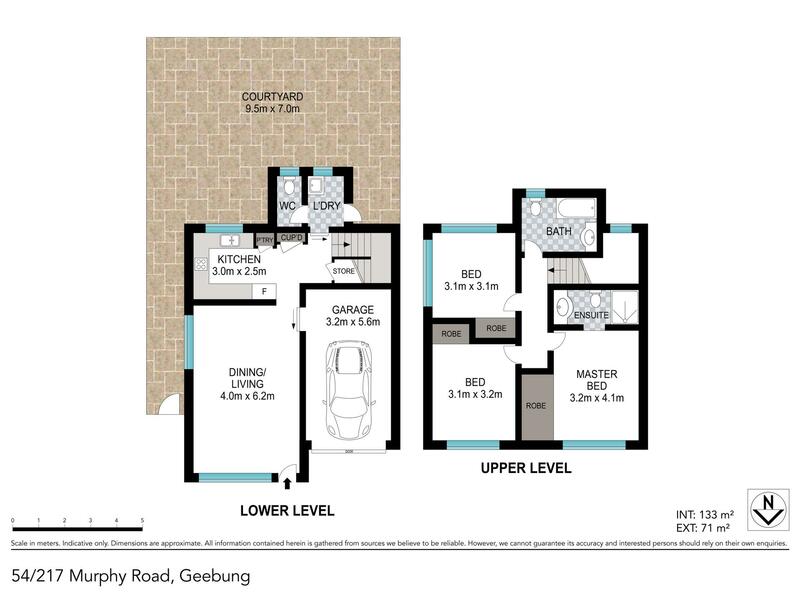 The excellent facilities in and around the area have seen the popularity of Geebung and its surrounding suburbs remain high and as such achieve reasonable price growth in recent years. Facilities such as hospitals, schools and shops are readily available. Chermside offers residents access to two hospitals and a major shopping centre featuring all major retailers and a restaurant and cinema complex. Leisure facilities around Geebung include plenty of bike and walk ways, picnic and barbeque especially along Downfall Creek in 7th Brigade Park. Spots near lagoons and wetlands are also available in neighbouring Boondall. Concerts and live shows are also closeby at the Brisbane Entertainment Centre in Boondall. Numerous private and public schools accommodating both primary and secondary aged children complement St Kevin Primary School and Geebung State School. Public transport is also good with two railway stations (Sunshine and Geebung) within the suburb's boundaries. City express bus services also run at regular intervals. Major roads such as Gympie Road or Sandgate Road put the commute to the city at around 25 minutes.